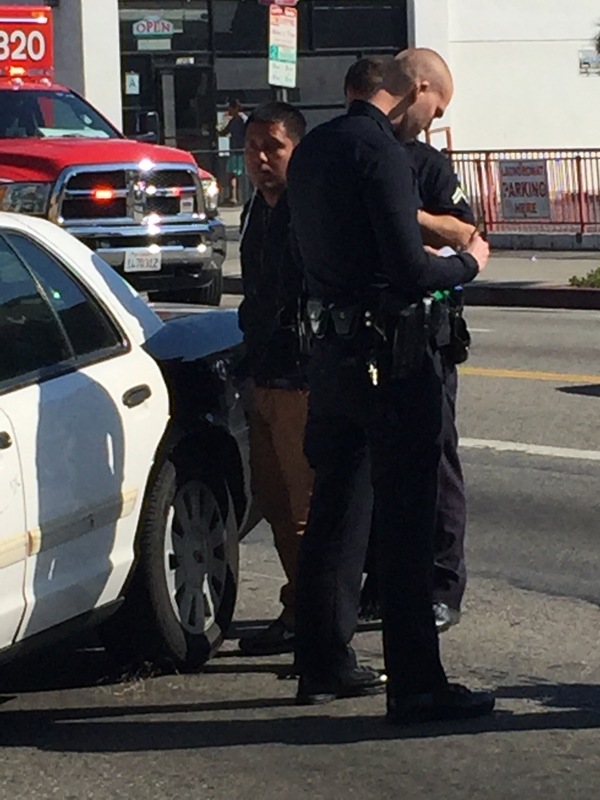 An alleged DUI male suspect on intersection Melrose Avenue and North Vermont Avenue was arrested for injuring a police officer with his car after leading authorities on a short pursuit, according to the LAPD Northeast Division. The suspect, who was not identified, was witnessed by two students from Los Angeles City College. Ixchel Hernandez and Danya Garcia both saw the alleged suspect get “pulled out of the car by force,” Hernandez said. According to Officer Mireles, the alleged suspect was completely uncooperative. The man was so disorderly that police had to break the driver-side window, as well as tasered the suspect to the ground after injuring one officer with his vehicle. The officer injured was pinned between 2 cars. Fortunately, the officer managed to walk away with only minor injuries. The vehicle that the suspect used as a weapon against the officer was a grey Volkswagen. The car was not reported stolen. All of the tires to the VW were deflated after the officer got injured. The suspect had no weapons minus the vehicle. The suspect’s car was storage for a lot of items such as prescription bottles, an empty grape Swisher wrapper, and a brown balled up blanket. The man was wearing a pair of mocha brown pants, a grey sweater, a grey shirt underneath the sweater, as well as grey, white, and black Nike’s. He had mild injuries upon apprehension. EMTs strapped the suspect onto a gurney and placed him into an ambulance as a police squad car followed behind.